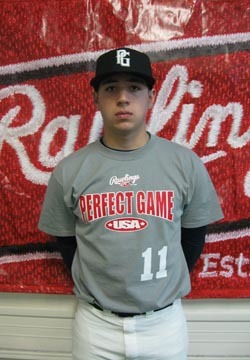 Daniel Whitecavage is a 2010 C/RHP/3B with a 6'0'', 180 lb. frame from Huntersville, NC who attends Hopewell HS. Athletic frame, some strength with room for more. Loose actions catching, looks athletic, receives ball cleanly, 2.12 best pop. Simple balanced hitting approach, short to ball, good extension out front, has quick hands and some bat speed, ball comes off hard, can turn on inside pitches, hitting tools to develop. Also pitched, high 3/4's release point, compact arm action, FB to 81 mph, some feel for 70 mph curveball. Very good student.